Yesterday’s weather was fantastic and just the kind of nudge we all need to get into the garden, so I spent most of the day painting indoors! Never mind, today’s a bit overcast, but I can still get some key work done, namely building and preparing my raised beds so I can get some crops in them as soon as possible. Last year I started sowing into module trays at the end of April and things like potatoes and direct sown roots didn’t get into the ground until mid to late May. At least I’m a little ahead of the game this year, although not perfect. 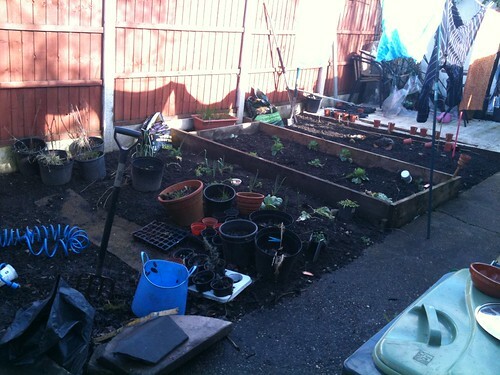 This is how the bed area of the garden looked after this winter. Basically it’s a mess. One actual bed, made from some wood that was given to me and then some areas poorly marked out for the other three beds. It’s not huge (or even straight), but it’s what I have to work with. I finally got round to ordering my scaffold boards from Fletchers Timber, in Spondon. I worked out I can make the three remaining beds from six, 13 foot boards, so that’s todays job. I’ve been up since 7:30am, thinking out what I need to plan. I have various seeds already, but this garden needs more compact growing varieties and I’m not sure exactly what I’ve got. I’ll check this later. Also, I’ve learnt from what happened last year. How big things got, what looked nice, what I enjoyed growing, what grew slowly, what grew fast, what worked, what failed and what I actually ate! This was going to be brassicas (cabbage, kale, calabrese), but they are slow growing and I decided I’d rather go for the pretty stuff that we can eat lots of. I may plant a few cabbages and some kale and try to inter-crop between them so I at least have some stuff growing through Autumn and Winter. Dead simple. Potatoes. Moved on a space from bed one, last year. I have a couple of bags of rotted manure that I’m gonna chuck deep in the soil. 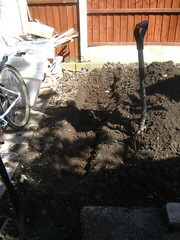 I’ll probably plant a mix of earlies, maincrop and some salads. Not sure what yet. Beans and peas. I never got round to doing these last year. In fact, I’ve never grown these before in my life. I tried sowing an over winter variety in modules, but the severe cold (-17? here!) killed them all. I have a few packs of seeds, so will make do with them and see how they go. Onions and garlic. My favourites. I always plant my garlic too late. I should have it in over winter, but have never had the ground ready in time. Maybe next year? This year, I actually have some healthy plants growing in Bed two that I missed when I dug the onions out last year. I’d like to transplant them to Bed four, but they may not take it too well. It seems a shame to move them at all. I’ve done some initial reading so I know roughly how much I can plant of which varieties using Pauline Pears’ ‘Growing Fruit and Vegetables on a Bed System the organic way’. It has some really good practical advice and, more importantly, some crucial tables showing the numbers of plants per 1.25m bed you can grow using closer raised bed spacings. Anyway, the sun appears to be coming out and my bacon’s nearly done. Time for a coffee, then off to work. Mr.Cole Copyright © 2015. Theme by MyThemeShop.